Symbolism is often used in literature to paint colorful scenes. It affords the writer artistic expression that supersedes bland writing. Beyond that, symbolism also allows readers to visualize complex or difficult subjects. And, if nothing else, it presents readers at the local book club with an opportunity to pick apart various lines of text, searching for hidden meaning. Symbolism can be an object, person, situation, event or action that has a deeper meaning in the overall context beyond a surface understanding. When used properly, it can enhance a piece of writing and provide further insight to the reader. Together, let's enjoy some examples of symbolism in literature. No doubt, you've come across symbolism in some of your favorite books. Below, we'll discuss some of the classics, like Wuthering Heights, and move onto more contemporary works of art, including the Harry Potter series. Emily Brontë went for symbolism right in the title of her novel. The "wuthering heights" are symbolic of the wild nature of the people involved in the story. It seems like, if Brontë could express herself with a symbol over the literal, she would've done so. Below, the foliage in the woods is symbolic of the ever-changing nature of love. And the rocks below the surface represent the necessary pain that comes from loving someone. My love for Linton is like the foliage in the woods. Time will change it; I'm well aware, as winter changes the trees. My love for Heathcliff resembles the eternal rocks beneath a source of little visible delight, but necessary. Aurora Leigh is an epic novel by Elizabeth Barrett Browning. She explores many ideals throughout the course of her work but it would seem women were a focal point for her. Instead of saying, "Women are undervalued," she compares them to a pair of slippers one mindlessly slips into at night. Harry's scar is symbolic of his bravery, like a badge of honor. After all, he survives major battle after major battle. But, it's multi-faceted because one could argue it also stands for emotional sensitivity, since it hurts when someone directs hate towards him. Albus Dumbledore's name is a symbol of his personality. Dumbledore means bumblebee in Old English and he liked to hum. Albus means "white" which may symbolize a white wizard or good wizard. The Golden Snitch symbolizes the spiritual enlightenment every "seeker" aims for. Knockturn Alley is a symbol for darkness and evil. Doesn't the name alone sound like nocturnal? To no surprise, the Dark Arts are practiced in this alley at night. As You Like It was one of Shakespeare's many plays. He takes the big picture - the world - and symbolizes it on a smaller scale - the stage. Meanwhile, the "players" are a symbol for the people of the world. We're all a part of the stage and we each have our part. Literature is ripe with symbolic elements. Let's glance through a few more examples of symbolism. Perhaps you'll find the desire to pick up one of these books on your next trip to the library! In Elie Wiesel's novel Night, night is used throughout the book to symbolize death, darkness, and loss of faith. In Nathaniel Hawthorne's The Scarlet Letter, the letter "A" symbolizes adultery. 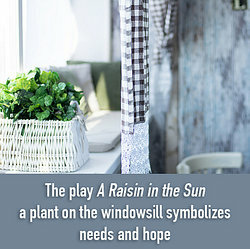 In Lorraine Hansberry's A Raisin in the Sun, a plant on the windowsill symbolizes need and hope. Like a plant needs the sun to grow, we have needs too. In Dr. Seuss's How the Grinch Stole Christmas!, the Grinch steals the symbols of Christmas, like trees, presents and food, to find out in the end, Christmas was more than those material things. In Hansel and Gretel by Engelbert Humperdinck, bread symbolizes comfort and bread crumbs symbolize the way home. Without question, poetry is a written form of art. Beautiful images are painted in the space of a few stanzas. It won't surprise you to see that poets are huge fans of symbolism. It allows them to take in-depth concepts and paint them in interesting terms that will, hopefully, spark the reader's imagination. What type of thoughts does a black raven conjure up for you? We've been conditioned to think of them as the carriers of bad omens. Perhaps it all began with Edgar Allan Poe. Nevertheless, he uses a black bird to stand for death and loss in what is perhaps his most famous poem of them all. William Wordsworth sure knew how to make a lady feel special. In the lines below, he uses "springs of Dove," "a violet by a mossy stone," and a star "shining in the sky" as symbols for a quiet, unknown woman whom he loved very much. In the poem below, Samuel Taylor Coleridge talks about an albatross, or large bird, that's about to be hung around the neck of the protagonist. However, it's not merely some strange form of punishment. And the bird's not just a bird. Rather, it's a symbol of the terrible sin he committed when he killed the bird. It's representative of the burden he must bear as a result. In this poem, William Butler Yeats is talking about "the heavens." He wishes he could grant the heavens' embroidered cloths to his beloved. In the end, however, he says he is too poor to provide her with these things. However, even if Yeats had all the money in the world, he still couldn't afford to buy the heavens. In this poem, his poverty is taken as a symbol of his (self-perceived) lack of talent, spirit, or imagination. Symbolism is a rhetorical device that's never going out of style. It allows writers to expose further truths, as they pertain to their message or theme. It also allows them to embrace the beauty - or the struggles - of life in thoughtful and unique ways. Symbolism is, arguably, one of the strongest literary devices writers have. Much can be said behind while hiding behind the symbols that stream from nature and everyday life. Why not venture into a deeper dive on symbolism in poetry? Enjoy these Examples of Symbolism in Poetry. "Examples of Symbolism in Literature." YourDictionary, n.d. Web. 18 April 2019. <https://examples.yourdictionary.com/examples-of-symbolism-in-literature.html>. Symbolism is often used in literature to paint colorful scenes. It affords the writer artistic expression that supersedes bland writing. Beyond that, symbolism also allows readers to visualize complex or difficult subjects. And, if nothing else, it presents readers at the local book club with an opportunity to pick apart various lines of text, searching for hidden meaning.Symbolism can be an object, person, situation, event or action that has a deeper meaning in the overall context beyond a surface understanding. When used properly, it can enhance a piece of writing and provide further insight to the reader. Together, let’s enjoy some examples of symbolism in literature.